This is your dream tour! 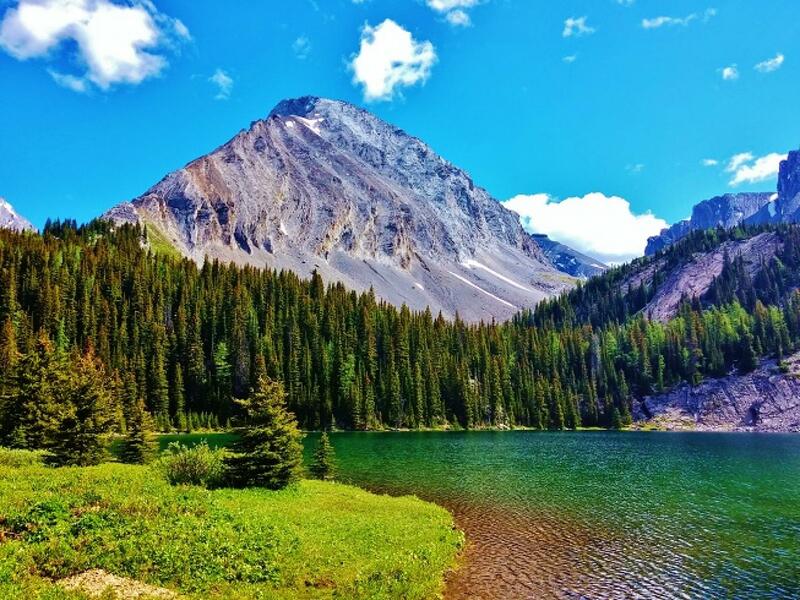 If you have always love the mountains and have always wanted to hike to your heart's content, this is THE PLACE to be in summer - the Canadian Rockies! This is where you'll be so spoilt for choice with the countless varieties of day hikes, it's like you're at a buffet and you don't know where to start! 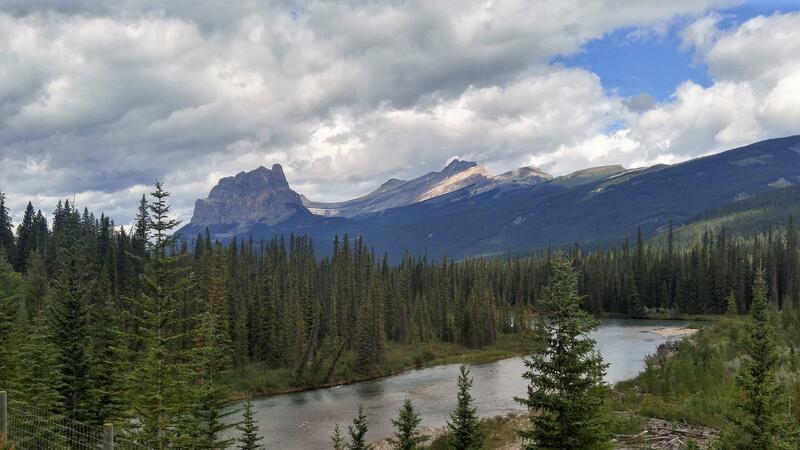 So, I have selected a few of the best day hikes for our 9-Day tour in Banff National Park, Yoho National Park, Waterton National Park, and Kananaskis Country. Here is a short description of some of them. This will be our very last hike on this tour, but it will the best one. Saving the best for last! I did this hike in the fall of 2016 and it was one of my best hikes because you don't just trek up a mountain and then down the same way. For a start, you have to take a ferry across the lake to get to the trailhead. That is the start of how special this hike is. On this hike (I would rate it moderately difficult) you get to traverse across a mountain range, pass through a few waterfalls, trudge carefully along a narrow ledge to a cave, climb up a ladder, crawl through a cave, and scramble up a rocky section assisted by chains. Your reward - Crypt Lake, at journey's end. Get to sit and enjoy your lunch as you rest in the tranquility of this lake. Click the link below to read the reviews of some hikers who have done the trail. There's a YouTube video on the hike "Solo Hiking Crypt Lake" but I decide not to post it here as it may spoil the mystery and thrill of the hike. Let's see if you can resist the temptation of watching it. *Pictures of my hike to Crypt Lake will be made available soon. Check back here! This will be rated as one of my Top 3 most beautiful and moderate day hike to a truly awesome lake. And you know what, it's a hidden gem that perhaps only the locals will know. First of all, it's in a Provincial Park - not in the big Banff or Jasper National Park that the majority of tourists have the time for. Secondly, it takes some rough driving on gravel road to get to the trailhead. I remember loving this trek because of the surprise of walking into two beautiful meadows on the way to the lake. The lake was the best - with flowing streams, a couple of log bridges, and the setting at the lake felt very Zen! I did this hike in July 2014 - click on the link below to read my blog. Scroll past the first blog, Mt Lady MacDonald, to see my Chester Lake blog. 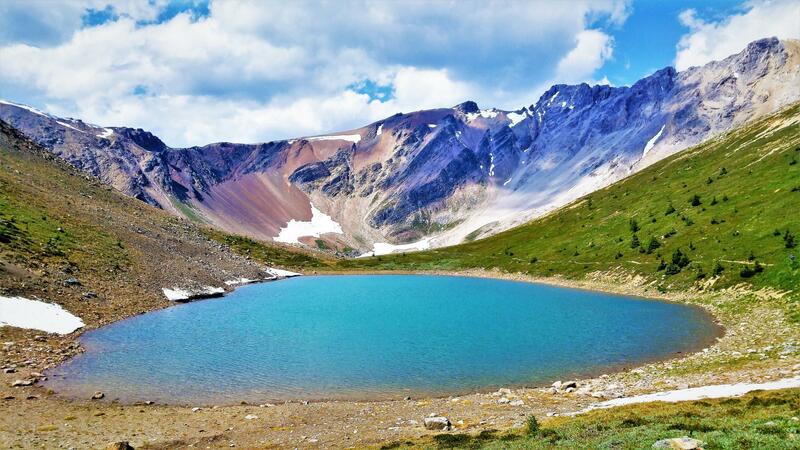 In July 2017, I decided to do this hike after someone describe to me how gorgeous the scenery was on the trail - the meadows, the wildflowers, the surrounding mountain views, and the stunning lake itself. More than that, you get to hike past the lake to Harvey's Pass where you can catch a view of Mount Assiniboine in the distance. Click on my FB link below to read my blog and see pictures of my adventure that day. To read the blog, click the first picture in the FB album and then the forward arrow on each picture. This lake has always arouse my curiosity whenever I drive on Highway #1 heading west past Lake Louise. 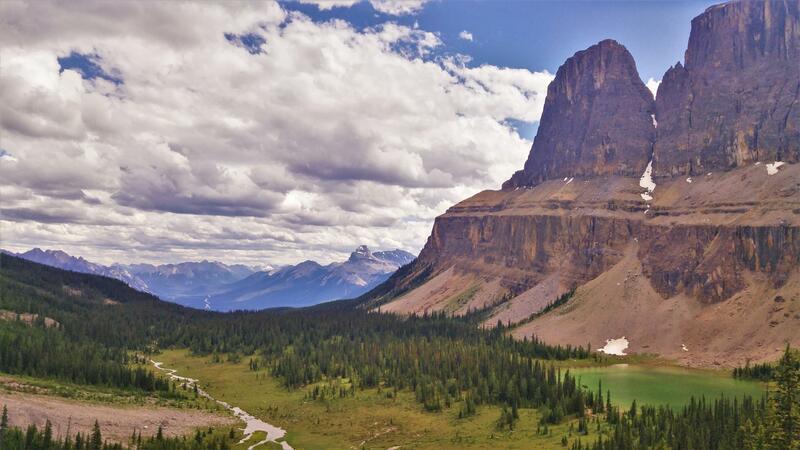 It sits at the foot of Castle Mountain which along with Helena ridge, forms a bowl that surrounds the lake. Actually, it's not so much the lake, but the bowl that makes me feel: "I want to see what is it like to be in there". As you start off at the trail head, with the majestic-looking Castle Mountain in your sights, it almost makes you feel like you are a knight on a journey to this daunting castle. Rockbouhd Lake has been rated in National Geographic as one of the World's Most Epic Day Hikes (Click on the link and it's number 7 on the slideshow). View of Castle Mountain (on the right) and Helena Ridge (on the left) from the highway. Notice the bowl and imagine Rockbound Lake (you can't see it) in the middle of it. 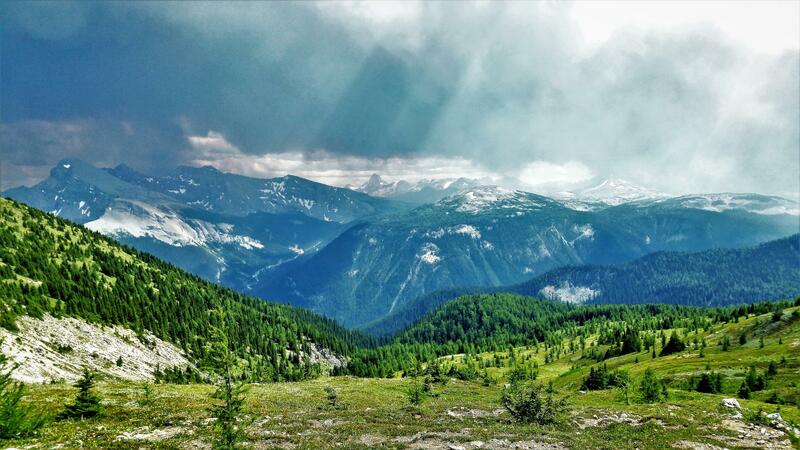 By far, the most beautiful trekking region in the Rocky Mountain Parks of Canada. To gain access, you need to book your ride on a shuttle bus to get to the Lake. 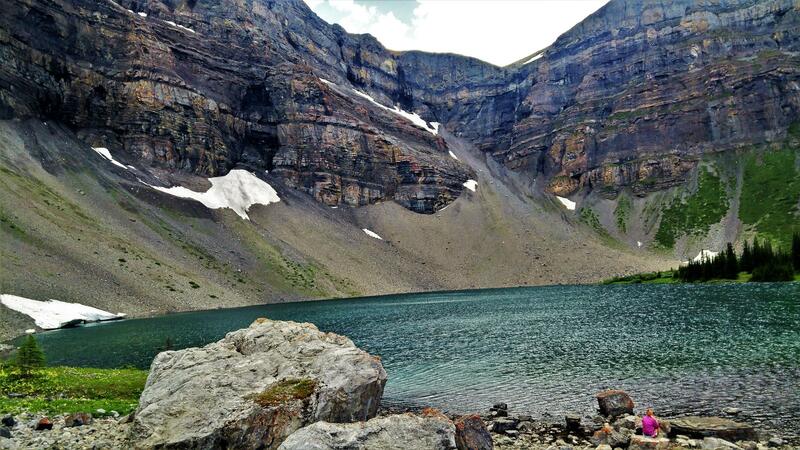 No promises, but we will try to get those bus tickets to do a hike in Lake O'Hara. The other option is to walk 11km on the hard tarmac road that the bus travel on to get to the Lake and the trails. And at the end of the day after you've done your hikes, you have to walk back 11km on the same road - unless you manage to get a seat on the shuttle bus coming down. Booking for the shuttle bus starts on 23rd April, so we'll have to see if we get the bus tickets to this restricted paradise. It is always a challenge to get tickets as the booking hotline is almost never accessible. If we don't get bus tickets, we will do Lake Agnes with Little Bee Hive or another similar trail. 1. This tour is limited to 6 lucky persons only, with minimum of 5 persons needed to proceed with the tour. If rooming situations allow for it, we may be able to increase the number to 8 persons. This wil be announced before you make your deposit for the tour. 2. This tour is meant for hikers. So if you join this tour, it must be because you love hiking and have been on many day hikes before. You are excited to go on hikes and love the thrill, mystery, amazement, and solitude of hikes. You have good fitness, and you are in good physical and mental condition to do long day hikes. 3. Once a group is formed for the tour (at least 5 persons) we will meet to have some walking or stair-climbing training at least 3 times a month. This is organised so that we will be more or less at the same level of fitness when we get there. It will also be a chance for us to bond as a group before we get there. 4. The tour will be mostly budget accommodations but also letting you experience what Canadians (and North Americans) do for recreation during summer. You get to experience five nights of camping outdoors in an RV at a local campground - close to nature and the wilderness. However, the campground will have clean bathrooms with flush toilets and shower facilities, the RV has comfortable beds and cooking stoves and appliances, and your stay will be an outdoor experience you probably will never get again. 5. We will have two RVs for this tour. Each RV has three beds and can accommodate three persons. If our gender mix for this tour do not allow us to separate the RVs in terms of gender, we will have mix genders in any one RV. We will inform you of the rooming configurations once you are committed to this tour, and after you have paid the deposit for this tour. Deposit can be refunded in full if you do not wish to participate after the rooming configurations are made known to you. However, once the rooms and RVs are booked, your deposit cannot be refunded. 7. Optional Activites and Hikes. The itinerary has five hikes. Only on the day of the Chester Lake hike on 14 July, that you have the time to do an optional activity like the Cave Tour, White Water Rafting, Via Ferrata, or Horseback Riding. The rest of the hiking days do not allow for Cave Tour and White Water Rafting unless you decide not to do the hike scheduled for that day. 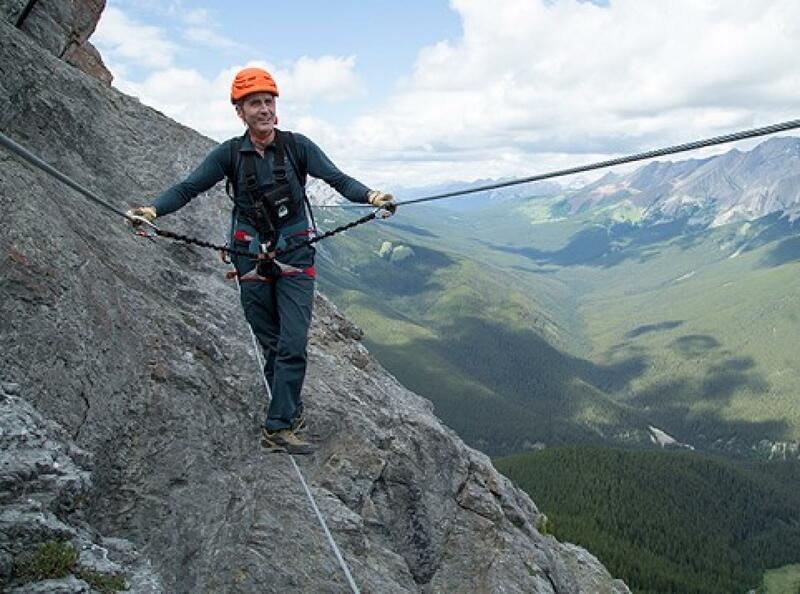 Via Ferrata and Horseback Riding can be included for the rest of the hiking days as they are shorter in duration. Alternatively, you may decide to extend the tour for a couple more days to do these actvities or to do some sightseeing - please inform me way in advance as accommodation have to be arranged for this. As you read this, almost all accommodations in the National Parks are full. 8. Weather and trail conditions will be considered before we do any of the hikes as scheduled in the itinerary. As such, the scheduled hikes may be re-scheduled, or replaced by another similar hike if weather or trail conditions are not favourable. 9. The upgrade from 5 nights of RV camping to 5 nights dormitory beds (additional CAD 395) is subject to availabiliiy of beds in dormitory and other scheduling factors. Please provide request in advance to allow for arrangements to be made. The tour will only be confirmed when we have a minimum of 5 persons. Maximum is 6 persons. Deposit of SGD 700 is to be paid by 5 May 2019 to secure a place on the tour. If we do not get a minimum of 5 Persons to form a group for this tour, the deposit will be refunded. Flights to Calgary is normaly priced in the range of $1,200 to $1,800. Flight duration averages around 21 to 27 hours. Airlines with lower fares are: United Air, Eva Air, Air Canada, a couple of China airlines that go through Beijing or Shanghai, and Cathay Pacific. It is recommended that flights be booked early to avoid fare increases. 2-hour, or 3-hour, or 3-hour with BBQ, also available.